Who’s ready for another cash giveaway? 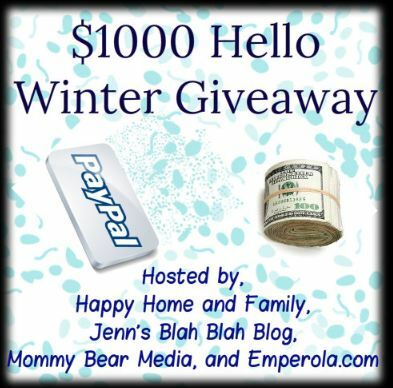 We’ve got another great cash giveaway for you so welcome to the Hello Winter $1000 Cash Giveaway! It’s also open worldwide! I know a lot of our great fans overseas have been waiting for another awesome giveaway! Tell us what you would do with the extra cash if you won! I would love to win some extra cash to do some home remodeling. I can’t win it but you can! Good luck everyone! Giveaway ends February 24th, 11:59 pm EST. To enter please use the Rafflecopter form below! Remember that all entries besides the mandatory comment entry are optional. Emperola.com was founded in summer 2012 in order to provide visitors with daily updated list of contests, giveaways, sweepstakes and deals. Enter your email here for a chance to win $500 in cash. If you run any kind of giveaway or contest feel free to add your giveaway at Emperola for free. Mommy Bear Media’s Mission is to help educate parents and individuals by providing reviews, lists and ideas about the best family-friendly movies. We want to empower everyone to make an educated decision about what media to bring in to their home. We specialize in children, family, Christian and popular movies and tv shows. Disclosure: This giveaway is open Worldwide, must be 18+ to enter. Winner will be contacted from admin@divafabulosa.com and will have 48 hours to respond to winning email. No purchase necessary. Void where prohibited by law. None of the other bloggers in this giveaway are responsible for prize shipment/delivery. This event is in no way administered, sponsored, or endorsed by, or associated with, Facebook and/or Twitter, Google, Pinterest. Aww. I would pay off some student loans!! I would use the money to get the rest of my husbands dental work done, he’s needed it for so long! I would use $300 of the money to pay for my oldest sons driving school lessons (in NJ it’s manatory that the kids take lessons). I’d take $300 and replace the other sons retainer that’s cracking and the balance I’d save for a little emergency fund. 50/50, $500 for me and $500 for Mom. I would use this for 2 house payments.I’m out of work with nothing coming in.. I’m needing a miracle as I try to hang on. Thanks for this giveaway! I would put it towards our vacation to Orlando. I would buy next year’s textbooks! I’d go on a trip to Europe! I use some for bills and then buy some clothes for myself, my boyfriend and our 2 daughters. I would pay down some bills…. I would put some away for retirement, the rest for my family and my local SPCA. Thanks! I would buy a new microwave and vacuum, do some grocery shopping, pay some bills and get pizza for dinner! It’s ho-hum, but I would pay bills. i would pay some bills and the rest i would put it towards a trip we have to take to see our son, he is in the military. Id buy things for the house! If I won, I’d pay it on bills. I would get the iPad that I always wanted and pay bills with the rest. I’d move the money to my savings account. It has low balance. I would put the money in my college fund. I would catch up on my mortgage payment. Besides getting a few things for myself, I would get many things for my family. i would buy a cruiser bike and save the rest of the money. Looking to buy a tablet. save it up for school. I would put it in my son’s college fund. Oh my gosh! There’s so many things I can think of. It’s hard to pick. I’d replace a few windows and buy gardening and canning supplies. I would get my wife an iPad and spend the rest on bills. Pay some bills and go on vacation! Thanks! I’d use it for a vacation to San Francisco! I will pay some bills! I would fly to VA and visit my Dad. I’d go to Disneyland with my kids and grandkids. I would pay bills with it. Buy college things for my daughter. I would get caught up on so many bills if I had this money!! it will help me to survive right now. times are hard. I would paint the house! I’d love to buy myself an i-pad. I’d pay up all the bills I could before I get married! i would buy a ipad and use the rest to have my car fixed. I would give 10% to God and enjoy my birthday Feb 14th and put the rest up for the rainy days. I’d pay for my husband to go to Denver to see his parents. I would pay off some bills, if I won. It would help to pay off my student loans. I would take me and my just married hubby on a real honeymoon! I would use it on a camping trip this summer. Thanks for the chance. I would use it to pay off some of that Disney World vacation that we took last month! I would buy a new pair of glasses(mine are from ’07 and the Rx is different now) and I would pay off the balance of my credit card. I would save it to put toward a much needed vacation. I’d put toward our rv expenses. I would buy some clothes for work and pay some bills. One half towards my student loan payment and the other towards my rent! Thanks for the opportunity! I will pay off my bills. I would put it towards a car. I’d use it for property taxes and new gutters! I would use it to pay some bills!!! I would pay off my daughter’s hospital bills and buy her some clothes . I would use $1000 for a family vacation. Bills, clothes, fill the chest freezer, shoes. Not necessarily in that order. I would put it towards paying off my credit card. I would pay my student loan ! Pay off some of my medical bills. Sadly, pay down some bills. I would pay off either the honeymoon cruise I’m taking with my wife in June or pay some bills. pay a couple of bills and spluge on something just for me! as much as I’d love to blow it and take a vacation or buy “things”, I’d have to do the responsible thing and pay bills! Iwould use the money for landscaping. It would go to bill and a new car battery. I would buy a iPhone 5 lol jk a new bike ! I would use it towards re-doing my bathroom!! I’d give my boyfriend an amazing gift he deserves! I need a refrigerator, mine died. I would pay my bills. Pay some bills and do some shopping!! I would pay some bills and spend a little on my boys and myself. I would buy a few things that I need. Maybe, memory for my laptop. Spend the money for vacation. I would buy my mother the couch she has been wanting and help her with bills. $1000 would go towards new tires on my car, the renewal of registrations for both of our vehicles, and bills! I would pay some bills and I would buy some books and clothes. I would buy new appliances for the kitchen. I would use it for a trip to Disneyland with my grandkids! I need to get a new washing machine. I would like to go on vacation but I would probably just save the money for bills. I would save it for my son’s college education. i will buy a laptop,a tablet and a good phone.. I would put the money towards a family vacation. Save the money for a vacation! I would get leaky my roof fixed. I’d pay some of my parents’ bills. I’m looking at a scary tax bill this year (cuz I had to tap out the IRA to get by) and have no way to pay it. So, I guess the answer is that I would send it to the IRS. This would help pay for my 10 week study abroad trip to Barcelona that’s coming up soon. I would buy a new Tv!!! Pay some bills and get my kids some clothes. If I win I’d maybe take a little trip and do some improvements to my house. not sure if this is a temporary problem or not but FB group 8 does not seem to be an active site. Please forward this error screen to http://www.thetummydiaries.com‘s WebMaster. If I win the $1000, I would pay off a couple of bills and take my honey out to a romantic evening followed by a night in a hotel in downtown Denver! 🙂 Sounds fantastic! I would use it on bills/ save it. Thanks for the chance to win! I would pay off a couple bills and buy some new books!!! I would buy some things the help with my photography hobby! We are moving to the DC and I would use these monies to help us with our relocation endeavor. I would pay my bills! And if there was any left, prolly not, but if there was I would put it towards my wedding in october. Put it towards our house we’re building this year! Pay off a credit card so I could get closer to getting a down payment for a home. I would travel home to see my parents! Go visit my father, whom I have not seen in 8 years! The last time I saw him I was pregnant with my youngest. I would take care of some things around the house and maybe go on a trip to somewhere warm. I would pay some bills and stuff for my family. I would send my husband fishing. I would pay my car insurance and mortgage. Get my daughters some clothes. My husband and I would both go to the dentist. This is so against facebook rules. Can not use like for entries per rules. Too bad they don’t enforce it. I am very sorry you feel this way. Per Facebook rules you must have the “likes” on an entry form. If we are mistaken, can you please show me where in the rules this is not right? We do have many giveaways that do not require this many “likes”. The reason we are able to give away the $1,000 is because we pool together money as bloggers to bring these giveaways to you. Thank you and I look forward to hearing from you. I’d put it towards student loans! I would pay a bill off. You rule!! This is a great contest! I’d get my husband a used car! Buy my kids a swing set. I’d take my Mom on a trip to a spa! If I won a thousand dollars I’d definitely buy myself the best music keyboard/synth/workstation and home recording gear to live my dream of being a music composer. Id put it towards a new car. i would use part of it for bills and then some on my kids! I would make some home improvements. I would buy a computer for my daughter and a battery for my car. Pay some bills that I am behind on! Get caught up on bills! I am trying to go see my mom in California, so this would help pay airfare for my family. I would use it towards paying off my credit card! Since it’s almost my birthday month. I would pay bills with one half and party with the other half. I would use it towards eyeglasses & medical bills. Thanks for the chance! I would put it on my student loans!!!! How amazing! put it towards college tuition for my son. Buy some gifts and save up the rest! I would go see my granddaughter. EVERYTHING! Bills and fun stuff!